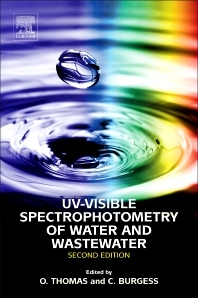 UV-Visible Spectrophotometry of Water and Wastewater, Second Edition, represents an update to the first book dedicated to the use of UV spectrophotometry for water and wastewater quality monitoring. Using practical examples, the book illustrates how this technique can be a source of new methods of characterization and measurement. Easy and fast to run, this simple and robust analytical technique must be considered as one of the best ways to obtain a quantitative estimation of specific or aggregate parameters (e.g., Nitrate, TOC) and simultaneously qualitative information on the global composition of water and its variation. This second edition presents the current methods and applications for water quality monitoring based on UV spectra, including the most recent works and developments. After the introduction of the basics for UV spectrophotometry understanding, the applications of UV measurement are presented, both from the family of chemicals and water quality parameters and from the type of water. Writing from years of experience in the development and applications of UV systems and from scientific and technical works, the authors provide several useful examples showing the great interest of UV spectrophotometry for water quality monitoring. At the end of the book, the UV spectra library of the first edition is updated with dozens of new chemicals of interest. Olivier Thomas is Emeritus professor EHESP, at the French School of Public Health, Rennes, France. He holds a State Doctorate in Physical Sciences, a 3rd cycle doctorate in analytical chemistry, an expert degree in prevention and treatment of pollution, and a Master of Science and Engineering Technical air and water environment of the University of Savoie. He worked at the University of Savoie, Chambéry, at the University of Provence in Marseille, and the School of Mines in Ales, where he was director of engineering laboratory and industrial environments. At the University of Sherbrooke, he became the first director of the Observatory of the Environment and Sustainable Development, leading an interdisciplinary network of nearly 150 researchers addressing complex environmental issues. Christopher Burgess was a Visiting Professor at the University of Strathclyde, Strathclyde Institute of Pharmacy and Biomedical Sciences; an elected member of the United States Pharmacopeia Council of Experts 2010 to 2020, and a member of the Expert Committee on Validation and Verification of analytical procedures. He is an internationally recognized expert in the qualification and validation of instrumentation and systems, analytical method development and validation and the statistical interpretation of data. In addition, he has extensive experience in quality systems design and development for the whole supply chain and has acted as a Qualified Person within the EU for more than 25 years. He has published over 80 papers and books in analytical chemistry and analytical science. He is the author of The Royal Society of Chemistry’s Analytical Methods Committee handbook Valid Analytical Methods and Procedures, 2000. His most recent contributions are chapters on 'Analytical Quality Management' in Analytical Chemistry, 2nd Edition (Eds Kellner, Mermet, Otto, Valcarcel & Widmer, Wiley, 2004), ‘Aberrant and atypical results and (in part) methods for determining limits of detection and quantitation in Method Validation’ in Pharmaceutical Analysis; A guide to best practice (Eds Ermer and Miller, Wiley, 2005), and, as joint editor with Olivier Thomas, of UV-Visible Spectrophotometry of Water and Waste Water. Elsevier, 2007. He was a member of the PDA (USA) Expert Working Group on OOS results.